According to research provided by the U.S. EPA, nearly 19 million Americans are potentially affected by 1,4-Dioxane contamination. UV-AOP is often the only economically and technically viable technology to remove or decrease the concentration of 1,4-Dioxane in public water systems. Achieve multiple-log reduction of 1,4-Dioxane to EPA health advisory level of .35 ppb or less. Determine the best design for your treatment objective by testing source water. A UV AOP system installed for 1,4-Dioxane treatment can serve dual purposes and additionally provide disinfection according to the EPA LT2SWTR. In some applications subsequent or polishing treatments with granular activated carbon (GAC) is required to remove any residual oxidant. Calgon Carbon can additionally offer complete applications consulting and supply of GAC and adsorption equipment. 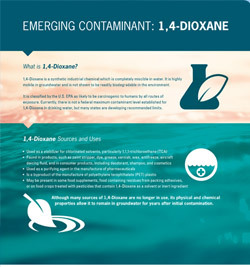 1,4-Dioxane is a synthetic industrial chemical which is completely miscible in water. It is highly mobile in groundwater and is not shown to be readily biodegradable in the environment. Classified by the U.S. EPA as likely to be carcinogenic to humans by all routes of exposure. Currently, there is not a federal maximum contaminant level established for 1,4-Dioxane in drinking water, but many states are developing recommended limits.